The European Space Agency's ATV-2 Johannes Kepler docks at the International Space Station on Feb. 24, 2011 after an 8-day flight. A huge European cargo ship linked up with the International Space Station today (Feb. 24), delivering tons of supplies for the outpost's crew just hours before NASA's planned launch of the shuttle Discovery. The robotic spacecraft, which is the size of a double-decker bus, docked with the space station at 10:59 a.m. EST (1559 GMT) as the two vehicles soared high over the Atlantic Ocean. Known as the Automated Transfer Vehicle 2, or ATV-2, the hefty space freighter is packed with 7 tons of supplies for the station's six-person crew. "Contact confirmed, capture confirmed," Russian cosmonauts on the station radioed mission control after the successful docking. The ATV-2 is named the Johannes Kepler and is the second robotic cargo spacecraft built by the European Space Agency to ferry supplies to the International Space Station. It launched atop an Ariane 5 rocket on Feb. 16. The cargo ship hooked up with the space station less than six hours before the space shuttle Discovery's planned launch toward the orbiting laboratory, clearing the way for the orbiter's flight, NASA officials said. NASA had already fueled Discovery for a 4:50 p.m. EST (2150 GMT) launch from the Kennedy Space Center in Cape Canaveral, Fla., at the time of the docking in space. The six astronauts set to launch on Discovery were apparently keeping track of the ATV-2 docking even as the geared up for their own flight. "ATV docking complete! ISS just got bigger," Discovery astronaut Nicole Stott wrote in a Twitter post. "Congrats to ESA and all the station partners around the world! If Discovery launches on time, the shuttle will arrive at the International Space Station on Saturday (Feb. 26). It is the final flight of space shuttle Discovery before the orbiter is retired later this year. When NASA's shuttle Discovery docks at the station, spacecraft and robotic arms from all five of the major international space agencies building the $100 billion space station will be at the orbiting laboratory at the same time. NASA and its Russian Federal Space Agency partners are discussing the possibility of staging a photo session to capture the space station scene. That idea would send station crewmembers on a flight around the orbiting lab inside a Russian Soyuz spacecraft, from which they would snap photos. A final decision on whether to go ahead with the photo op is expected during Discovery's mission, NASA officials have said. Like their name suggests, Europe's Automated Transfer Vehicles are unmanned spacecraft designed to fly themselves to a docking port on the aft end of the space station. After months parked at the station, they undock and are intentionally destroyed by burning up in Earth's atmosphere. 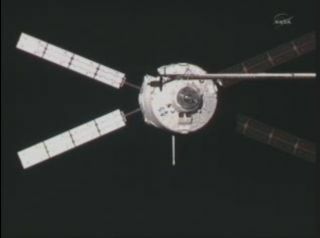 ATV spacecraft look like big cylinders with four solar arrays, giving them a dragonfly-like appearance. They are about 35 feet (10.7 meters) long and 14.7 feet (4.5 meters) wide. The first vehicle of the fleet, the ATV-1 Jules Verne, launched to the space station in March 2008 and ended its mission in September of that year. ESA officials have said each ATV mission costs about $600 million and the entire fleet cost about $2 billion to develop, according to Spaceflight Now. The cargo packed inside the ATV-2 Johannes Kepler includes 3,527 pounds (1,600 kg) of equipment and other dry supplies, 2,200 pounds (998 kg) of rocket propellant for the station's thrusters and 220 pounds (100 kg) of oxygen for the station's crew, NASA officials said today. There is also 10,700 pounds (4,853 kg) of propellant stored aboard the ATV-2 craft itself to help boost the space station's orbit from time to time, they added. The ATV-2 Johannes Kepler is expected to spend about four months docked at the International Space Station. It follows the arrival of two other unmanned cargo ships – Japan's H-2 Transfer Vehicle and Russia's Progress 41 space freighter – at the space station in the last month. After its space shuttle fleet retires this year, NASA plans to rely on Russian, European and Japanese spacecraft to ferry crews and cargo to the space station until American-built commercial space vehicles become available. After Discovery's launch today, NASA plans to fly two more shuttle missions and then retire the fleet for good after 30 years of service. You can follow SPACE.com Managing Editor Tariq Malik on Twitter @tariqjmalik. Staff writer Denise Chow (@denisechow) is providing mission coverage of Discovery's final space voyage from Cape Canaveral, Fla.